Can hybrid electric vehicles beat diesels on mpg? Hybrids have always had a miles-per-gallon advantage in urban driving but new EQUA Index data shows that they are gaining on diesels in motoway or highway driving and, if current trends persist, hybrid electric vehicles (excluding plug-in hybrid electric vehicles) are set to take the lead in 2017. The dotted trend lines in the above graph, representing motorway mpg for diesel vehicles and gasoline hybrids tested by Emissions Analytics, are converging. While the downturn in diesel mpg may be due to a change in manufacturers’ focus from fuel economy to NOx emissions, what is more striking is the improvement in gasoline hybrid performance on the motorway as a result of technological advances. The step change in technology is even more noticeable when European EQUA data is compared to North American EQUA results. The graph below shows gasoline hybrid performance in the US is particularly impressive on our combined cycles. With this level of fuel economy it seems unlikely that diesel vehicles will ever make a significant impact on market share in the US. With the mpg penalty of some NOx aftertreatment systems, perhaps it was to gain a fuel advantage over hybrids that Volkswagen resorted to using a defeat device when bringing their diesel models to the US market. Another noticeable effect of the different product mix in the US is the level of carbon monoxide emissions. Both regular gasoline cars and gasoline hybrids have much lower CO emissions than their European equivalents, with regular gasolines 30% lower and gasoline hybrids 64% lower. This is despite the fact that the US have a less strict limit, at 2.1g/km, than the EU’s, 1.0g/km limit. When we last wrote about hybrid vehicles back in October 2014, we concluded they were delivering “good but not best-in-class fuel economy, but [were] typically the cleanest, and if you are a light-footed, congested town driver, they are ideal.” Two years on hybrids, particularly in the US, have really upped their game. They are still a cleaner drive than a diesel and may soon offer better fuel economy wherever you drive them but heavy-footed drivers should still exercise caution. Emissions Analytics is pleased to announce the launch of the EQUA CO Index. The second in the EQUA Index series, EQUA CO looks at whether carbon monoxide regulations are being achieved in real-world operation. Potentially fatal for humans as well as damaging to the environment, carbon monoxide is generally considered a problem primarily confined to gasoline vehicles. Regulations distinguish between the fuel types, with diesels having a more stringent but, due to their technology, easier to achieve limit of 0.5g/km. Gasoline vehicles have to meet a more generous 1.0g/km limit which is typically achieved using a three-way catalyst. Therefore, the regulations are not technology neutral and allow gasoline vehicles to emit twice that of diesels and still be compliant. Using these classes, a diesel car awarded an A to A++ meets the regulated level even in real-world driving, whereas a gasoline vehicle with a C to A++ meets the regulated levels for this fuel. Of the 734 vehicles currently on the EQUA CO Index, 96% emit the regulated amount of CO or less. However, there are some interesting exceptions. Several Mercedes C-Class diesels are over 0.5g/km, out of a small number over the limit. Additionally, 8% of gasoline vehicles, that is 24 models tested by Emissions Analytics, do not meet the regulated limit, with one outlier being more than six times over. If the regulations were to change and gasolines had to achieve the same, stricter standard as diesels, the number of cars failing to reach this standard would increase to 20%. Of the hybrid vehicles tested, all achieve the regulated limit apart from the Mitsubishi Outlander which scored a D-rating when not running on its electric engine. The vehicles tested by Emissions Analytics are all run on our standard real-world cycle. The tests are conducted by a small pool of highly trained technicians and the vehicle and testing equipment is carefully prepared to make sure it is fully warmed up and in the manufacturers’ default settings. The data shows that illegal levels of carbon monoxide are not as prevalent in real-world driving as excess NOx from diesels. However, given the toxicity of CO, this is a situation that needs to be monitored. This could become particularly relevant if there is a market shift away from diesel towards gasoline as a result of dieselgate and other emerging regulations and taxes. Emissions Analytics will continue to keep a watchful eye on on-road vehicle performance, checking it against official certification and publishing the results online on the Carbon Monoxide page at the EQUA Index site. Subscriptions are available to the Emissions Analytics database. Contact us for details. Thermal windows: the next big scandal or an innocent technicality? Recent months have seen a growing a body of evidence, from different sources, that NOx emissions from cars are higher when the ambient temperature is lower. This month, Emissions Analytics mined its real-world database to assess the evidence. The accusation is that NOx reduction devices, including exhaust-gas recirculation, are programmed for reduced operation below the 20°C of the official test. The effect would be higher NOx emissions, with the motivation supposedly to deliver better real-world fuel economy. Some manufacturers argue that this is, in fact, to protect the engine from damage at lower temperatures, and that doing this is perfectly legal. However, with average temperatures in the UK around 9°C across the year, this has a potentially significant impact on air quality and governments’ attempts to achieve air quality targets. 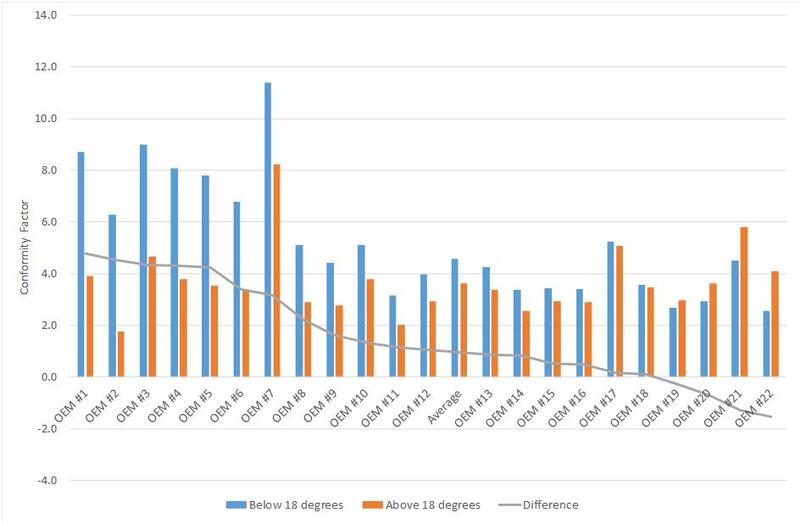 To quantify the issue, we segmented NOx data from our on-road PEMS tests into groups above and below 18°C, and found the following differences in the average Conformity Factor (ratio of real-world NOx to official limit). While the result for the Euro 5 vehicles was statistically significant, this was not the case for Euro 6 due to a small number of very high emitters. As our sample size increases, we will be better able to assess whether there is a pattern for Euro 6 cars. Looking in more detail at the Euro 5 vehicles, the data suggests that there are seven manufacturers with clearly higher emissions below 18°C, which is shown in the chart below. The intention of this newsletter is not to name names, but to indicate that it is not one manufacturer but several that may be utilising the thermal window loophole. If the hypothesis is correct, it could mean that many millions of vehicles on the road today in UK and the colder parts of Europe are putting out higher emissions than expected. Further, as Euro 5s, these vehicles are not that old and therefore will be on the road for many years to come. With Mitsubishi Motors the latest manufacturer to admit to impropriety in its testing procedures, the need for impartial real-world data has never been greater. Today Emissions Analytics is launching the new EQUA Index rating scheme to help bring transparency in the first instance to the issue of air quality. The EQUA Air Quality Index is intended to complement the forthcoming regulations for new vehicle certification, by monitoring vehicle performance when driven normally on roads; in effect keeping a watchful eye on the effectiveness of the new regulations.The problems with the existing test system, the NEDC, which have been the cause of so many of the issues covered by the media recently, are already being addressed by regulators in Europe. From 2017 the World Harmonised Light Duty Test Protocol (WLTP) will change the way CO2 is measured and Real Driving Emissions will address problems with NOx measurement. The other great benefit of the EQUA Air Quality Index is to help car buyers. Designed to be clear and concise, the simple A to H rating allows manufacturers and retailers to show how different models compare in the showroom, whether diesel, petrol or hybrid. It is also ideal for car reviewers and publishers to include as new cars are reviewed. And because the scheme is independently financed and researched, consumers, companies and the wider automotive industry can have confidence in the impartiality of the data. There are almost 450 vehicles on the EQUA Air Quality Index now, so why not have a look?